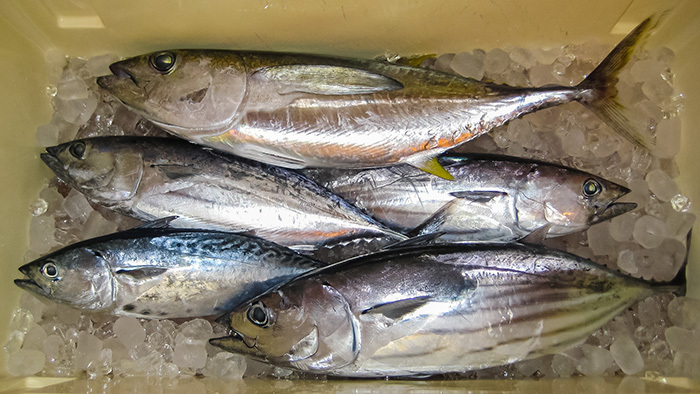 Here’s information on those interested in deep sea fishing in Hawaii. Fishing is more than a sport in Hawaii. For centuries, it has been a means of survival and is deeply rooted in the Hawaiian culture. Even today, there are many Hawaiians who depend on the bounties of the ocean as part of their daily diet. That is not to say that recreational fishing has no place in Hawaii. On the contrary, fishing is a very popular way of enjoying the wonders of nature for both local residents and visitors. Fishing boats at Kewalo Basin in Honolulu. Deep sea fishing is the main attraction for those looking to enjoy the open ocean and beautiful seacoast surrounding the Hawaiian Islands. 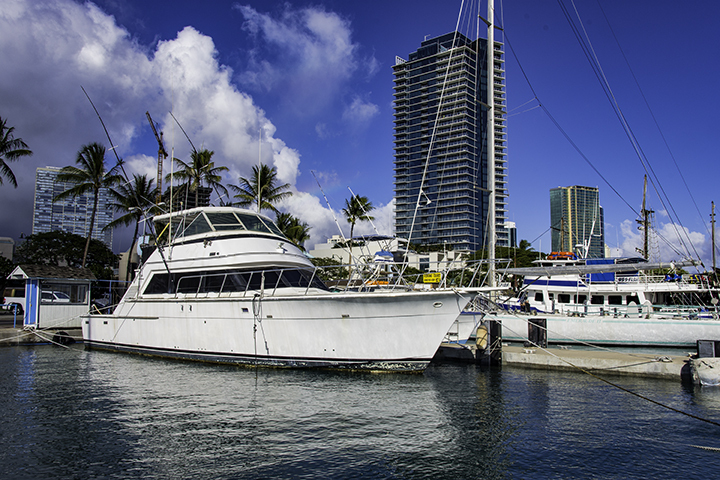 You can find numerous fishing boats that you can charter at any of the small boat harbors in Hawaii. On Oahu there is Kewalo Basin and Ko Olina harbors. Ma’alaea and Lahaina are the harbors on Maui. Honokohau and Kawaihae are small boat harbors on the Big Island. While Nawiliwili and Port Allen are the fishing boat harbors on Kauai. A full day of fishing can typically range from a $200 to $1,500 for 8 hours of deep sea fishing. If you are just testing the waters, then it may be a good idea to book a 4 hour half day trip. Especially if you are after big game, you are not guaranteed to catch anything. Remember that this is called fishing, not catching. Check with the charter boat operator on whether you can keep your catch. Some charters factor in the income from the sale of the catch into their charter costs, so it is important to know that information ahead of time. The charter boat will usually provide everything you need including fishing gear, tackle, and bait. You will generally have to bring your own refreshments. Some will provide lunch for an additional fee. Here are game fish you will be trying to catch when trolling: marlin, mahimahi (dolphin fish), ono (wahoo), ahi (tuna) and aku (skipjack tuna). If bottom fishing, you most likely will be going for uku (grey snapper), kahala (amberjack) and ulua (giant trevally). Recreational deep sea fishing in Hawaii does not require a license. Generally speaking, most of the fish that you will be catching have no limits on them. But your boat captain will tell you if there are any as well as fish that you should not eat. For example, because they prey on fish that eat tainted coral, kahalas are prone to ciguatera, a disease that affects the nervous system. If you are a novice or just new to the sport, there are some things you should keep in mind when considering deep sea fishing in Hawaii. Freshwater fish are generally smaller and does not typically require tremendous effort to land your catch. On the other hand, deep water gamefish, such as ahi or marlin, are relatively large and can take a lot of energy to catch. Let your charter boat operator or booking agency know that you are new to the sport. They will be able to make suggestions and recommendations as to the type of trip you should book. Being on Hawaiian waters, which can be rough at times, is definitely not like being on a lake. If you are prone to motion sickness, you should take motion sickness medication well before you board. This is because if you do get seasick before taking medication, no amount of it will help you after that. There is nothing worse than being seasick on the ocean and is a sure way to ruin an otherwise great day. Finally, the Hawaiian sun is often brutal, especially to those with light complexions. Bring and use waterproof high level SPF sunblock and re-apply it often. To give your eyes a break, be sure to bring and use polarized sunglasses. It will cut some of the intense glare from the water.